A potential public health concern has been percolating into aquifer drinking water supplies in the Tulare Basin and Salinas Valley for the past 50 to 60 years. Nitrate is accumulating in the groundwater, with 1 in 10 residents in these areas exposed to potential contamination of their drinking water supplies. This problem will worsen if nothing is done to correct it. Some nitrate comes from septic tanks and wastewater treatment plants, but our UC Davis research team recently concluded that the overwhelming source of nitrate contamination—more than 90 percent —is from agricultural fertilizers. The researchers studied nitrate in the drinking water of these two agricultural regions —an area that includes Fresno, Bakersfield and Salinas. Throughout the region, nearly all of the 2.6 million residents rely on groundwater for drinking water. Overview of cropland input and output (Gg N/yr) in the study area (Tulare Lake Basin and Salinas Valley) in 2005. The left half of the pie chart represents total nitrogen inputs to 1.27 million ha (3.12 million ac) of cropland, not including alfalfa. 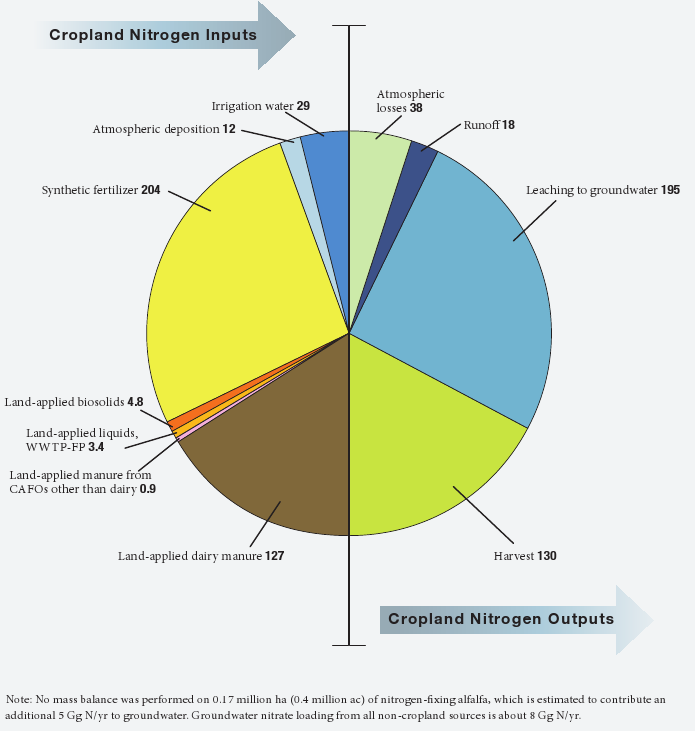 The right half of the pie chart represents total nitrogen outputs with leaching to groundwater estimated by difference between the known inputs and the known outputs. Nitrate contamination is a common problem among the world’s agricultural regions. So for California, addressing nitrate in drinking water supplies is an opportunity to provide leadership at a time when food and fiber production must nearly double to feed the world by 2050. The contamination in the Tulare Basin and Salinas Valley has worsened with the increase of synthetic fertilizers and the growth of confined animal feeding operations. Yet, even if we were to completely eliminate the sources of nitrate in groundwater, this region will continue to have a drinking water problem for the next 10 to 30 years, because groundwater moves very slowly from nitrate sources to drinking water wells. There are long-term benefits to reducing those nitrate sources, but fixing the immediate drinking water problem will require significant costs for many years. Our UC Davis research estimates that roughly 254,000 people in the study area drink water from wells with potential nitrate contamination. This could become a serious public health risk. Nitrate has been linked to infant death, cancer, as well as thyroid and reproductive disorders. State and federal regulations on nitrate in public drinking water systems keep tap water safe for the vast majority of people, but at a financial cost to water users. Reducing nitrate in the water delivered to consumers could involve drinking water treatment or connecting to cleaner water sources, all of which cost millions of dollars. 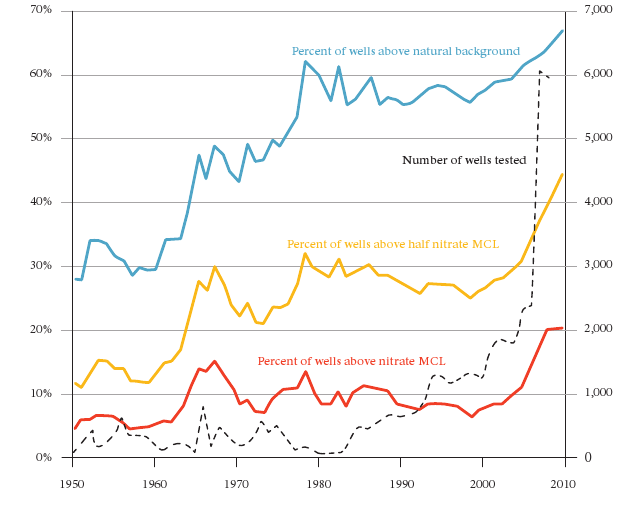 Five-year moving average of the percentage of wells for which the average annual measured concentration exceeded 9 mg/L (background), 22.5 mg/L (half of the MCL), and 45 mg/L (MCL) in any given year. Since the 1990s, an increasing number of wells other than public supply wells have been tested. In 2007, Central Valley dairies began testing their domestic and irrigation wells on an annual basis. Some efforts to reduce nitrate sources can be accomplished at relatively little cost, through improved education, irrigation, and nutrient management changes. But much larger – and costlier – source reductions are needed to stop groundwater degradation. 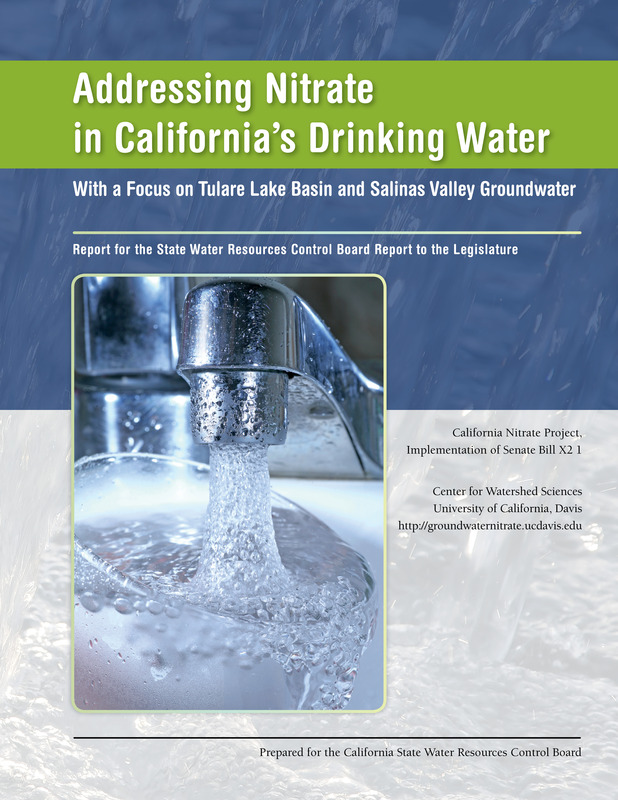 This UC Davis study was done for the California State Water Resources Control Board, in response to state legislation requiring examination of the sources and costs of handling nitrate contamination in the Tulare Basin and Salinas Valley. It involved 26 researchers and graduate students, numerous undergraduate students, 28 external reviewers, numerous external scientific and technical discussions, as well as an active Interagency Task Force. The reports estimate that fixing the small drinking water systems affected will cost $20 million to $36 million each year for several decades. The reports also outline options for funding these solutions. Options include compensation agreements from nitrate dischargers, a fee on nitrogen fertilizer use, or a water fee. The various state and county officials who own aspects of this problem would be well served by a coherent state policy on groundwater nitrate contamination. The reports lay out facts, some cost estimates, and the range of options to help elected and appointed officials make informed choices. The most immediate and unavoidable problem is drinking water. How should California manage these small water systems, and how can the costs of mitigating nitrate contamination be defrayed for these often poor communities? Nitrate discharges to groundwater and the degradation of underground water supplies are a chronic problem. Do the economic benefits of groundwater degradation outweigh the negative effects of degraded groundwater? Will it be cheaper, and better for all, to pay for the treatment of small water systems and preserve agricultural jobs? Would such an approach threaten long-term groundwater salinization from some of the same sources? Who will bear these costs of source reduction? Any solution requires more organized collection and analysis of groundwater data, along with better technical and policy coordination among affected agencies, including the state and regional water boards, county health departments, and the state departments of Public Health, Food and Agriculture and Water Resources. The cost of addressing the drinking water problem is much less than the value of agriculture in this region. But without a firm state policy, this problem will become harder and more expensive to solve. Reducing the nitrate leaching will slow the rate at which the problem worsens over time, but the drinking water problem must be addressed today. This entry was posted in California Water, Economy, Nitrate, Planning and Management, Sustainability, Water Supply and Wastewater and tagged agriculture, California, Central Valley, environmental justice, nitrate, UC Davis Center for Watershed Sciences, water supply. Bookmark the permalink.